Posted on September 9, 2013, 6:56 pm, by Kathryn Huxtable, under Other. So there’s this thing on Google+ going around, where Carolyn Curtis has been drawing Calaca skulls from the Mexican Day of the Dead from people’s profile pictures or other photo. Carolyn is doing black and white drawings. I’ve coloured a couple of them for people. Here’s one of my friend Mz Maau. Posted on February 20, 2013, 9:55 pm, by Kathryn Huxtable, under Other. 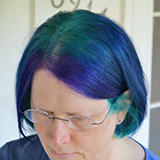 It’s six months now and my hair is still multicolored, with the dominant color being blue, but with green and purple showing. Posted on October 6, 2012, 1:15 pm, by Kathryn Huxtable, under Other. My Kindle PaperWhite arrived today. I wasn’t expecting it until Wednesday. So far, it’s nice, but it’ll take a bit adjusting to a touch screen interface. I’m not sure it’s a good idea to get rid of buttons. I’m curious how the lighting will work in a dark room. Posted on October 2, 2012, 6:40 pm, by Kathryn Huxtable, under Other. Posted on September 16, 2012, 9:57 pm, by Kathryn Huxtable, under Other.